Last edited by melbrod; 01-17-2017 at 11:06 AM. One of my favorites and it's so true! Lol, there are so many true things in here! I just saw this on FB. Really good article. Should be required reading. I smirked at this comment - a early / common mistake by some, I am sure. a) Bring up price either at the end of the first contact (if it’s been successful and you feel a connection to this person) or in a follow-up contact. I'm so glad I read this prior to putting out my feelers. Even though I knew a lot of those points already, getting a good conversation going imo can go a long way. And if you don't feel like you can talk to your breeder... well, you're going to be "stuck" with them for the next 8+ (hopefully 12+!) years, you might as well get used to it! Just know you're not alone cause I'm gunna make this place your home. You will never sleep alone, I'll love you long after you're gone. I stickied this. I love Ruffly Speaking - it's chock full of fantastic stuff about good breeding. Thank you for making a Sticky of this. I agree with pretty much everything in the article. That was a great read. I'm happy to say I researched for the breed I wanted and the breeder it took over a year. I have been in contact with my breeder choice since June and met her and her dogs in person in October. I met the mom, who was ( not sure what the proper wording is ), mated beginning of September, three ties and so on.... Waiting for Mother Nature patiently. I found something that took me to a spreadsheet. User jywel417 is close to me. Just hope he/she is still active. Good read! I have a litter at the moment and get so many emails saying 'Yeah, I'll take x colour collar' or 'How much for pick of litter?' And they go straight into the recycling bin. It's not found anymore on that site. Last edited by melbrod; 01-17-2017 at 11:07 AM. Thank you! What a great read. Gave me a few chuckles. Great article! I had a question from that read. 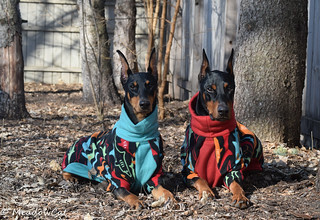 If you only want a Doberman as a pet, rather than to show, are you now increasing the chance of receiving one with health issues? Or are the differences simply cosmetic? I understand the reason for selling only the best puppies for those who interested in showing, however. There are pet quality puppies in every litter. If you are buying a puppy from a reputable breeder, who is breeding to improve the breed and has done all the proper health testing on the two parents with good results, you are generally buying a puppy who is just as healthy as the rest of the puppies in the litter. 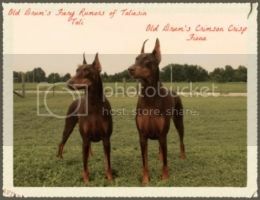 Dobermans do have a lot of health problems, though, and most of them have a genetic component to them, so the puppy could inherit problems that have not shown up in the parents that may be present further back in the line. That is why you need to look at a dog’s pedigree beyond the mother and father, because you may see a problem in the grandparents, or you may see too many breedings to the same sire. Also check the health records of pups from other breedings of the parents, and at the health of the parent's siblings, if you can find them. It is possible that a trait might show up in a puppy that is undesirable in any doberman that will affect its health....But yes, a lot of the time it is just a matter of cosmetics. Or there may occasionally be a puppy with a problem like a birth deformity, for example--but the breeder should point that out and tell you what the possible consequences are.